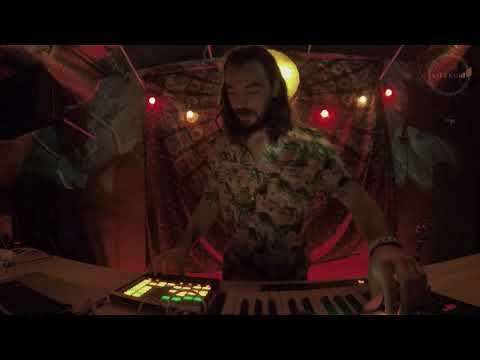 KUSHT is a Scottish born wanderer who takes inspiration from all over the world to create a psychedelic fusion of folkloric and electronic music. His live shows consist of stirring downbeat music, enriched by delicate sampling as well as his heavily distorted and delayed guitar. Feeling closer to the mountains and the colder north his sound reflects the connection to his Celtic roots and yet mixes a playful groove with hypnotising melodies and the power to transport you to familiar memories or distant grounds. “Kusht is a word we use in Scotland to describe any moment, any feeling or any place. It is when something feels especially nice so I paint on the canvas with all the frequencies i can conjure to create a kusht moment for you and anyone you wish to share it with." The acclaimed producer quickly became well-known in the scene and already played some of the most beautiful electronic festivals such as Fusion Festival, 3000Grad and Garbicz Festival to name a few..
After releasing two EPs with huge feedback in the scene, he is now writing for his third album and debut vinyl press coming early 2019! This release [Vardo] is supposedly crafted as an ode to Kusht’s dedication to travelling, leaving his home for the road and bringing in elements from all the destinations in mind. Accordingly, you can hear Celtic, African, South American, Gypsy, and forest/nature influences, with a strong dedication to clear and organic production.